ST. PETERSBURG, FL – Anthony M. Greco has mastered the science and the art of electron microscopy, but he has also mastered some other crucial qualities that go along with any scientific discipline: education and outreach. His courses on Transmission and Scanning Electron Microscopy are perennial course offerings at the USF College of Marine Science (USFCMS), and his regular participation in the Great American Teach-In is exemplary of his desire to engage the community. 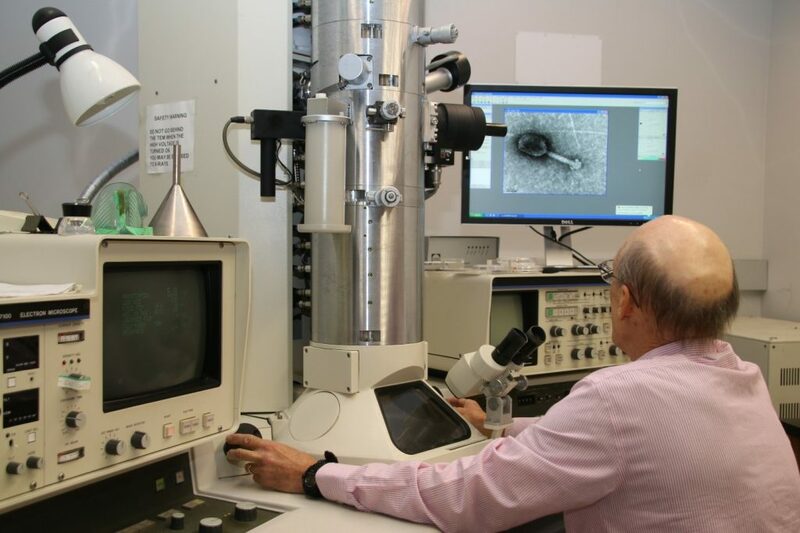 Tony runs the Electron Microscopy Laboratory at USFCMS, which houses a Transmission Electron Microscope (TEM), Scanning Electron Microscope (SEM), X-ray Microanalysis System, and sample preparation equipment for the TEM and SEM. 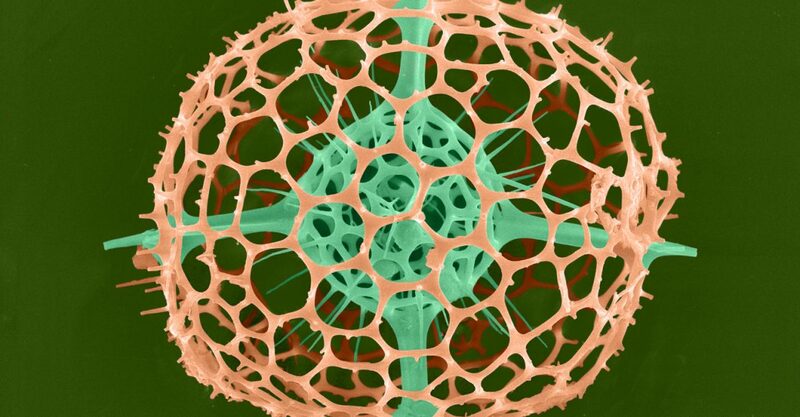 The two microscopes function very differently but complement each other perfectly; the SEM looks at the surface of a cell with its splendid array of microstructures, and the TEM peers into the cellular depths to explore the ultrastructure of a cell. These powerful visuals are sought out by an array of scientists from almost every discipline. “One thing I can do is provide visual evidence for something that they may have discovered with another technique, like PCR,” Tony explained. Polymerase Chain Reaction (PCR) is used in microbiology to make multiple copies of a specific DNA segment. 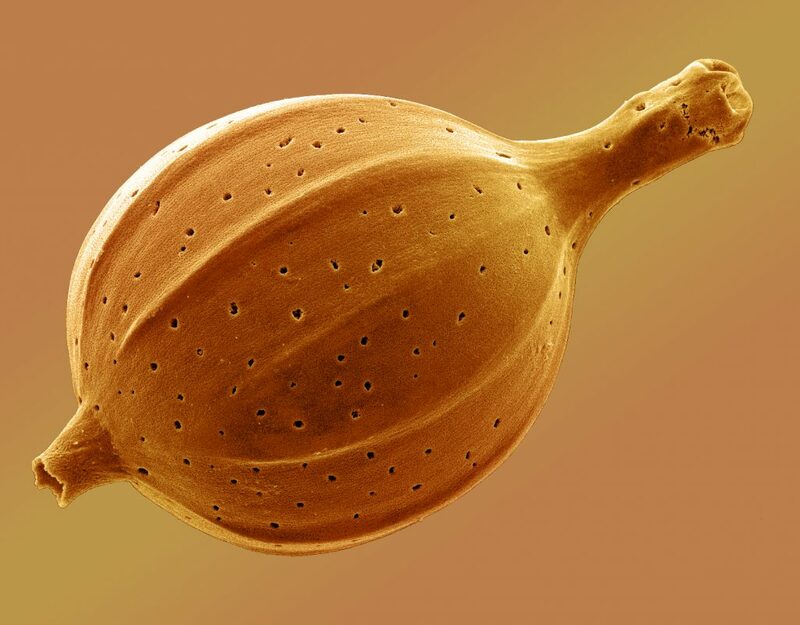 The discovery of new viruses and bacteria often warrants confirmation in a form that our visual-centric minds prefer. To prepare a sample for analysis by TEM, Tony must cut extremely thin slices using a diamond-blade attached to a machine called an ultramicrotome. Slicing tissue samples at such a high level of precision (typically less than 100 nanometers thick) requires its own preparation. Small pieces of tissue or biological material are preserved with a type of fixative, then dehydrated with ethanol and finally embedded in resin. The small block of resin provides a convenient shape to position within the microtome. As slices are shaved off by the diamond, they fall into a tiny container of water and float on the surface for retrieval. The operator, usually Tony, looks through a microscope throughout the cutting process to make sure the slices are of the right size and thickness. Tony Greco prepares a sample for slicing on an ultramicrotome. Caption: Manning the TEM station, Tony Greco looks at an image of an individual virus. 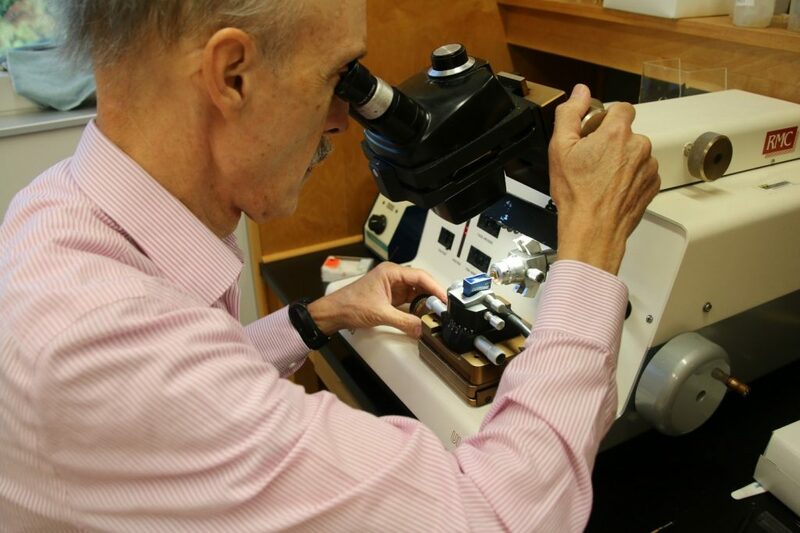 Although trained researchers and students who have taken the TEM class are welcomed to prepare the samples themselves, most of them ever so gratefully request that Tony handle their samples. Tony obtained his Master’s in biology from Western Kentucky University, and it was there that he first learned how to operate a TEM. During the summer after graduation, while working at the state of Pennsylvania’s Department of Agricultural, he had the opportunity to work with both TEM and SEM instruments. This led to his next job, a position at the University of Pennsylvania where Tony worked with an SEM in conjunction with an X-ray microanalysis system. The X-ray system adds incredible value to SEM analysis. With this additional device, a researcher can know the elemental composition of whatever item is being scanned by the SEM, which is very useful in the case of similar-looking organisms. X-ray microanalysis “uses the electron beam of the SEM (or an X-ray beam) to knock out orbital-shell electrons in the sample,” Tony said, as he explained this fascinating application. In the unstable atomic structure, outer shell electrons attempt to return the atom to stability by falling into the vacancies left by the ejected electrons. However, the electrons that attempt to fill the voids have too much energy for those vacancies and they give up excess energy in the form of a characteristic X-ray. Displayed on a computer monitor, peaks on a graph represent the characteristic X-ray signatures of specific elements –calcium, carbon, oxygen, etc. 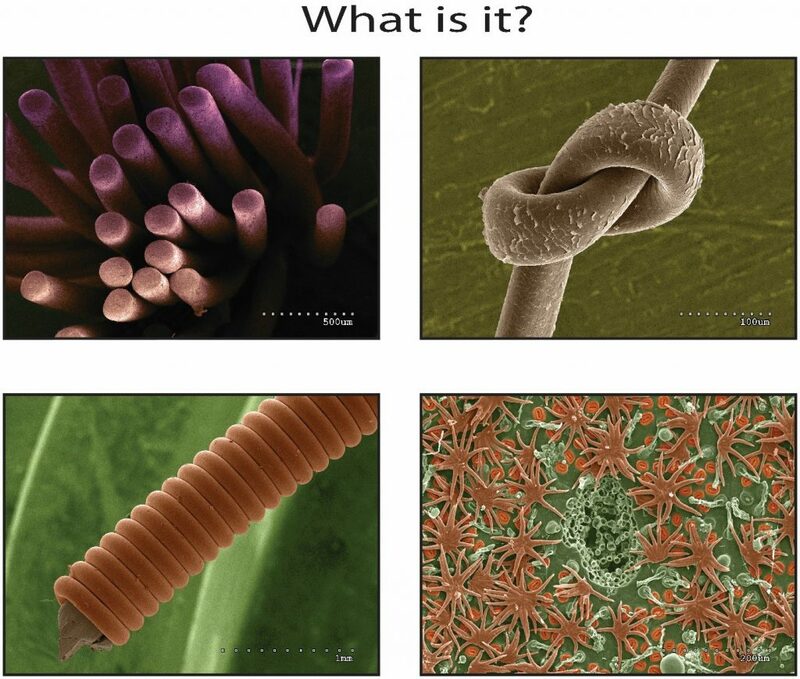 The preparation of samples for SEM analysis is nearly as impressive as the stunning images produced. Samples are not air-dried but rather critical-point dried. They’re first dehydrated with ethanol, then fluid is replaced with liquid CO2 and driven to the critical point temperature and pressure using a specialized chamber. This method ensures that surface tension, which would result from air-drying, does not distort the item. Tony came to CMS in 1980, working as a researcher and co-teaching courses on electron microscopy. He took the lead on full-semester SEM and TEM courses for graduate students in 1994, and three years ago he implemented an undergraduate student version of the SEM class in which undergrads learn alongside grad students in the same classroom. To date, this is going very well, and the undergrads from USF St. Petersburg have excelled in their coursework. Expanding his positive influence and spreading the word on electron microscopy, Tony goes to elementary, middle, and high schools annually to participate in the Great American Teach-In held the week before Thanksgiving. A guaranteed crowd-pleaser in Tony’s presentation is the stereo images. Viewed with red blue 3D glasses, the exciting images come to life, but stereo imaging “can be more than just ‘Gee whiz!’ It can give you vital information about the surface topography and reveal more accurately, depressions or elevations in areas that may not be evident with one image. It also allows you to measure micro-heights on the surface,” said Tony. For some excellent SEM imagery and more, come out to the St. Petersburg Science Festival this Saturday, October 20,2018, and be sure to stop by Tony’s booth in the USFCMS tent.